This meal is packed with not only protein but flavor. It’s quick to prepare, under 10 minutes, and you can serve it either as an appetizer or for your main course. To prepare this, I purchased a store bought Thai Peanut Satay Sauce and mixed it with some peanut oil. 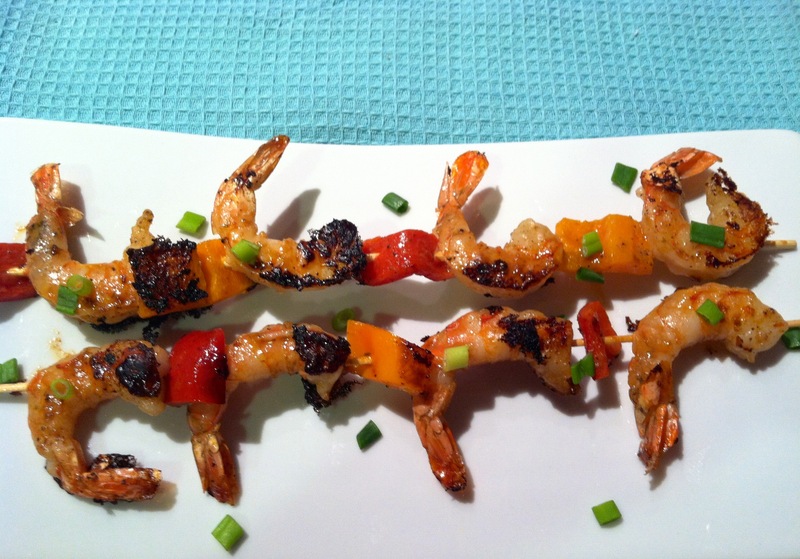 I place the shrimp on skewers, alternating with some red and orange peppers and then brushed the sauce on them. I heated a non stick griddle until hot and cooked the shrimp skewers for 3 minutes on each side. Added some green onion for added flavor. Talk about quick and delicious! Enjoy! Peel and clean the shrimp, leaving the tails on. Divide the above ingredients in two. In a small mixing bowl, mix the peanut satay sauce and the peanut oil. Place the shrimp on the skewers by inserting straight through lengthwise onto the skewer. Alternate with the peppers and shrimp. Season with salt. Brush one side with the peanut mixture. Heat a nonstick skillet until hot over medium heat. When hot, place the skewers, sauce side down, on the skillet and press down on the shrimp so they make contact with the skillet. Cook for 3 minutes. Brush with additional sauce and carefully turn the shrimp skewers over and cook for another 3 minutes. Serve on a plate with green onion. Thnx! It was delicioso and so quick!